Our site for the next 2 days! For the first time in one year we woke up to a different view....we are still in parkland, but now it is the hill country of Aguanga, CA. 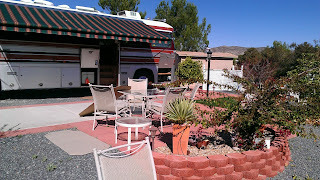 We stayed in the boondocking area of Jojoba Hills Escpaee (SKP) Park....our site, 224, was occupied until this morning. 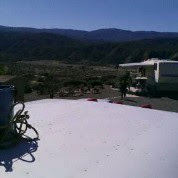 We moved up the hill at 9:30am, and at 10am Mike and Lisa Sylvester arrived to install our solar charging system. Today they ran all the cabling, and associated wiring for the Blue Sky Charge Controller, and battery monitor. Before they began Mike did a thorough inspection of all the possible routes we could follow, but trying to determine the most direct (shortest) route from the panels to the batteries. We came up with "Plan A" that was acceptable to Elaine and I, and then they began pulling wire. Amazingly, Plan A worked. The wiring was run through the refrigerator "chimney" and into the wire tunnel on the passenger side, through the cabinets on that side, and down the wire chase along the right side of the front windshield, and through the floor into the house battery compartment. 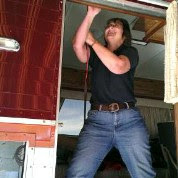 Mike and Lisa (The RV Guy, Inc.) are wonderful technicians. They kept us involved in every decision along the way. We are very happy with their professionalism, and expertise. 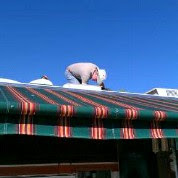 They are certified installers for A.M. Solar, whom we bought out solar panel kit from. A. M. Solar shipped the kit directly to Mike and Lisa here at Jojoba Hills, so everything was here waiting for our arrival. 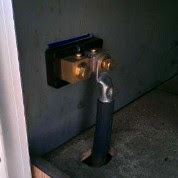 The "shunt" that will monitor all the in going voltage, and out going voltage. That's it for today.......this retirement thing is really a lot of work!!! LOL! Thanks for stopping by and sharing our journey! Tomorrow morning at 8am the installation will reconvene. The actual solar panels will be installed, along with the charge controller and monitor, and by this time tomorrow night we will be officially solar powered! OK, now it is January 30th....it is about 6am, and the only thing left to do is unplug the umbilical cord from the power pedestal, turn over the Detroit Diesel 6V92 and say goodbye to schedules. I just handed over the keys to the golf cart we have had use of since we arrived here a year ago to or fellow camp host who occupies the site immediately adjacent to ours....in fact it was on a Monday, January 31st, 2011, exactly one year ago, that we pulled into Rancho Jurupa Regional Park for our 1 year sojourn. We really already done the hard part.....compacting our lives into a little under 300 square feet.....AND...the BIG AND, learning to live with each other in that same space. We have never looked back, and love our simplified lifestyle. As I was lying in bed this morning cuddling with my wife I thought about wonderful our life has been these past 40 years together.....raising 5 children to adulthood, and how proud we are of them and the families they are now raising. We're not wealthy people, but we feel so rich right now. I had no idea how much our children were going to miss us until yesterday. As I posted previously, we had all our kids, grandkids, and many friends of our kids over to the park for an extended goodbye party two weeks ago, and I have seen each of my children several times since then, so I thought we had said our goodbyes, but yesterday morning I got a text from my youngest daughter, who is 27, saying she had a dream that we left without saying goodbye. I texted her back to meet us at our sticks and brick home around 1:30pm as we were helping my oldest daughter move back into our house. She came over as we finished unloading the truck, hugged me and started crying. Then my oldest daughter did the same, and then my youngest son, etc. Man oh man do I hate goodbyes! In just 30 minutes we will start the Detroit Diesel and motor up to my mechanic's shop (Joel's Automotive) in Upland, CA. 6:30am.....as we drove past the Kiosk (checkstand) the three people on duty all came running out and waved goodbye! I tell you, these people we have worked with the past year are the salt of the earth people. We will truly miss them A LOT!!! 9pm.....we got my mechanic's shop around 7:30am, and I deftly backed the rig, including trailer, into his lot so he could begin the work scheduled previously....oil change (5.4 gallons of Shell Rotella T 40wt Heavy Duty), oil filter, two fuel filters, check transmission fluid, check tires, recharge panel A/C. We left at just after 1pm with the service work done. We then headed south on I-15 to Temecula, CA, and then east on HWY 79 to Jojoba Hills SKP Park where I sit now finishing the post I began this morning. The day has been a whirlwind capped by my last soccer match, a high school match, in Corona, CA at Santiago H.S. Elaine went to bed early....7:30pm....she is tired, and so am I, but we are both smiling a lot. We are on the road, at last!!!! 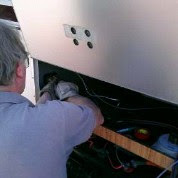 Tomorrow morning Mike Sylvester, The RV Guy, a certified installer for A.M. Solar, will begin the installation of our 300 watt solar charging system tomorrow morning. With any luck we will leave late Wednesday, or Thursday morning to head southeast. Lots of pictures tomorrow both of the park we are in, and the installation of the panels. Good night for now, and thank you so much for stopping by and reading! No, the title of this post is not today's date....you haven't misplaced 6 days overnight. January 30th is the day we crank up the Detroit Diesel 6V92 power plant and begin our trip south, and yet to be told adventures. We are busy tying up all the lose ends. I spent most of yesterday at my office "taking down" everything. Putting files into storage, removing pictures from picture frames so they can be scanned using our recently acquired Docuscan, which, by the way, is a wonderful piece of technology! Thank you Nick Russell for recommending it! 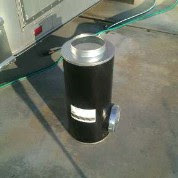 In preparation for my visit to my mechanic early on the 30th I removed the 3 year old air cleaner for my Detroit Diesel so I could order a replacement. Man, that thing is big! 3 years ago, when I was still quite naive, I paid $348 for the one I just removed. With a little help from a fellow Newell owner I found a source online where I could get the same one for $122.50 shipped (NO shipping charge). I got it via FedEx yesterday and it is, thankfully, identical to the old one, so I will be rolling up my sleeves and installing it later on today. On Monday my mechanic will drain out the old Shell Rotella 40wt Heavy Duty motoroil (takes 3, or 4 gallons), change the oil and fuel filters, and recharge my A/C. 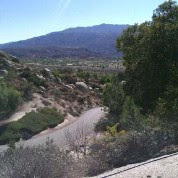 Sometime early that afternoon we will head south to Temecula where we will have our A.M. Solar panel kit installed by an authorized representative starting on the afternoon of the 31st. He should be finished by Noon of February 1st....we will sit for an additional 24 hours while the sealant cures, and then on the 22nd we will go back north to I-10 and head southeast into Texas over the next few weeks. We'll stop off over night in Indio to visit a very good friend, and then in Mesa to have a new fridge installed, which has been donated by a good Newell friend, and then off we go into the wild blue yonder.....OK, I guess that's a mixed metaphor! We'll be flying low along I-10 for a week, or so. So, things are heating up in my neighborhood. As of today I have 5 high school soccer matches left on my schedule, and then I will become an officially retired soccer official. It's been 17 days since I last posted......I have watched lot of College bowl games in the last 17 days. Amazingly the worst game I watched was last night's BCS National Championship game between Alabama and LSU. But, the most important thing is we are just 21 short days away from departure day! We are doing our final sifting and sorting, and deciding where everything will be stowed. Amazingly everything we really want with us will fit with room to spare. A month ago I was not optimistic.......even a little! Fortunately, my wife has very exceptional spacial skills. When we would take driving trips it was always her job to fit everything in the trunk, and she always did! My brother and his family are coming in their trailer this weekend to see us off, and the next weekend my kids are coming to the park. The park staff is holding a going away party this Friday evening for us and another couple who have finished our tour of duty. The high school soccer season is winding down. Of the 46 games I was assigned, only 13 remain. The time, she is a flyin' by! One of the things Elaine is hoping to finish before we hit the road is to finish scanning all of our pre-digital camera family pictures. 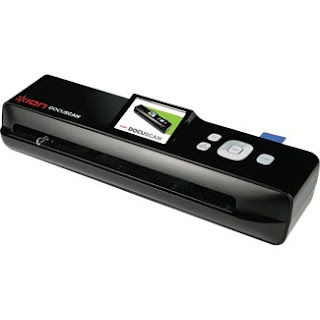 To speed this job up we bought a Docuscan. 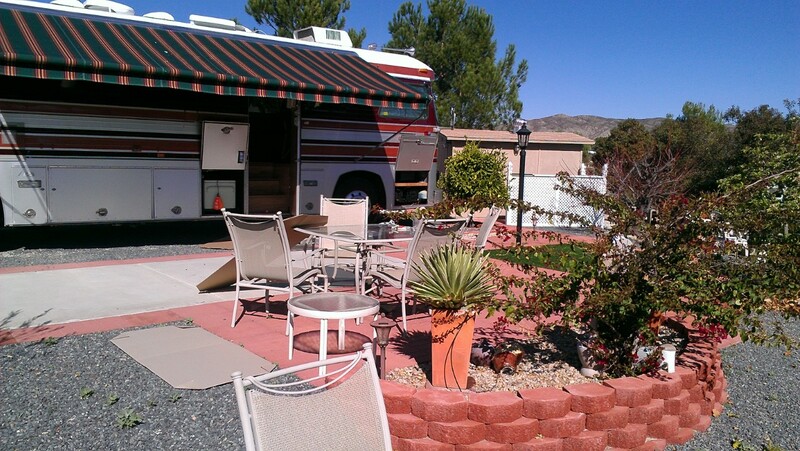 A blog we follow, Nick's Blog, recommended this device to those of us living the RV life style. I can say without reservation that his recommendation was a wonderful one. Thank you Nick! There is a very short learning curve, and is very easy to use. It comes with a 1 gb SID card. The cost is around $99. The weather here in Rancho Jurupa Regional Park has been clear. For the first week of 2012 it was in the 80's. It has settled back down to the low to mid 70's each day. We haven't had rain in about 6-7 weeks, so it has really been a dry fall and early winter. One thing we have had way too much of is Santana winds. I can't remember the last time we had an onshore breeze. It's been offshore for about 2 months now......not the norm for sure. Well, that brings us up to date. Thank you for stopping by and reading!